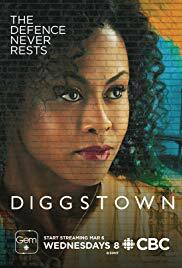 DIGGSTOWN follows Marcie Diggs (Vinessa Antoine, Being Erica, Heartland), a star corporate lawyer who reconsiders her priorities after her beloved aunt commits suicide following a malicious prosecution. The team of lawyers that Marcie works with are a curious band of do-gooders, cynics and scrappers – messy souls struggling to keep personal disappointment and demons out of their practice. They work directly in the community to find justice for their diverse clients, exploring issues of racism, poverty and gender bias.